The Museum is #5 in the TripAdvisor Top 10 Museums in Ireland. This is hot on the heels of our recent TripAdvisor Certificate of Excellence for 2016. The Management and staff would like to thank all our wonderful visitors throughout 2016. 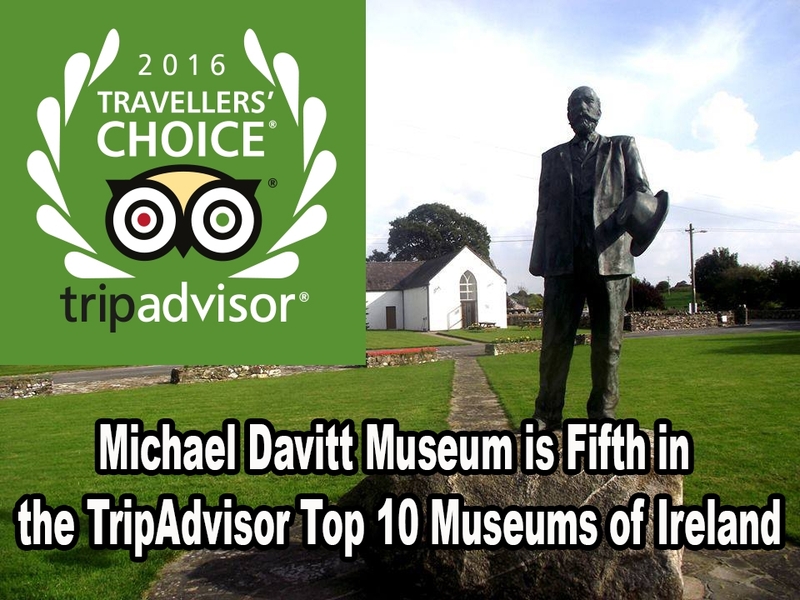 The Michael Davitt Museum is located in the picturesque and historic village of Straide in Co Mayo on the N58 route between Ballyvary and Foxford. The museum is housed in the magnificently restored pre-Penal Church that was used prior to the enactment of the 1690’s Penal laws which were more commonly known as popery laws. The Michael Davitt Visitor Centre includes the beautiful surrounding grounds of Straide Abbey, which together with parking and picnic area provides an ideal destination for one of the great family days out in Mayo.. The Museum staff are knowledgeable and friendly. We welcome you with a free video and guided tour of exhibits and the abbey; we can also help with genealogical searches. We look forward to your visit. The Michael Davitt Museum contains an extensive collection of historical artefacts including original documents, photos, Land Acts, letters, postcards, posters, rosary beads and other items connected with Michael Davitt’s life and his campaign work within the National Land League. Davitt was a social reformer, Member of Parliament, author, GAA Patron, Patron of Glasgow Celtic FC, labour leader and international humanitarian. He is Mayo’s most famous son and Ireland’s greatest Patriot. Michael Davitt was christened in 1846 during the time of the Great Famine in the Penal Church in Straide. The church is adjacent to the 13th Century remains of Straide Abbey. Founded in 1245 Straide Abbey has a magnificent medieval high alter. Michael Davitt is buried in the cloister area of the Abbey. Anne Deane President of the Ladies Land League is buried in the Abbey.